Nowadays, in a download, post-LP and virtually post-CD world, the order of album tracks has become devoid of meaning. Toying with eternal ‘favorite’ playlists is cool. but track order was an important factor defining the succes and artistry of an album. 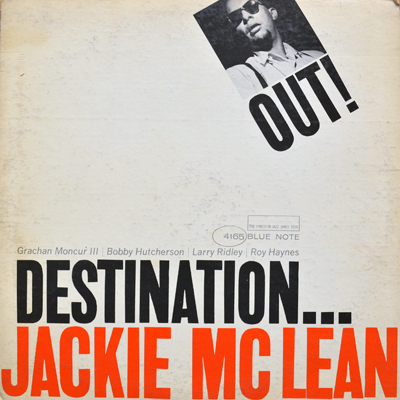 Clearly, what would’ve made stand-out alto saxophonist Jackie McLean’s progressive album Destination… Out! more significant than it already is, is a reversal of the opening tune, the telling, macabre mood piece Love And Hate, with the album’s up-tempo winner Esoteric. Esoteric is an intriguing piece that pushes the group to put its best foot forward. With the bulk of it consisting of short, stabbing breaks, solo space included, the group balances on a tight rope. Only experienced, smart and original cats are able to pull off such a thing and this group succeeds convincingly. Jackie McLean incorporates piercing, passionate hard-bop phrases into a characteristic modal structure. Veteran and innovative drum legend Roy Haynes, who dates back to the era of Charlie Parker and was well-versed in swing as well as avantgarde, and who played on a staggering number of high-profile recordings, responds well to the ‘new thing’ trombonist and composer of three tunes out of four, Grachan Monchur III sets up. Haynes (nicknamed ‘Snap Crackle’) fervently includes a wealth of his trademark crisp snare rolls and demonstrates his mastery of the cymbal. After writing as prolifically as Monchur III did during that period, it was inevitable that the trombonist found himself amidst avantgarde royalty and was given the chance to record as a leader. Monchur III’s Evolution, with both Jackie McLean and Bobby Hutcherson in tow, was recorded two months after Destination… Out! and is nowadays regarded as a royal achievement in its own right. His improvisations on the trombone on McLean’s album are uncommingly swift. If the title of Esoteric gives you a clue to what kind of feeling this group likes to convey, McLean’s sole original Khalil The Prophet decidedly puts a lid on that puzzle. Although I, personally, regard writer and thinker Khalil Gibran, of which McLean apparantly, as well as millions of others, has been under the spell of, as a charlatan spouting nothing but quite infantile, easily digestible, pseudo-wise clichés, (what we Dutch commonly say, ‘selling fried air’) the result of that particular inspiration, I gladly admit, is pleasantly ethereal. The group sound, a peculiar and original mix of instrumentation, is lithe, conveying a buzz in the head of the listener on par with the joy of spring or lover’s goosebumps, whichever direction your senses’ antennae are pointing at. The direction Jackie McLean took in the early sixties – mixing hard bop with modality – placed him squarely in the front line department of Blue Note as one of the major forces behind that label’s much admired stretch of hip-to-the-tip releases.